Nazari Zenouz, F., Moghaddam, G., Abdi, Z. (2014). Weight Changes and Sexual Behavior in Ghezel Intact and Castrated Male Lambs. International Journal of Advanced Biological and Biomedical Research, 2(5), 1761-1767. Farshid Nazari Zenouz; Gholamali Moghaddam; Ziba Abdi. "Weight Changes and Sexual Behavior in Ghezel Intact and Castrated Male Lambs". 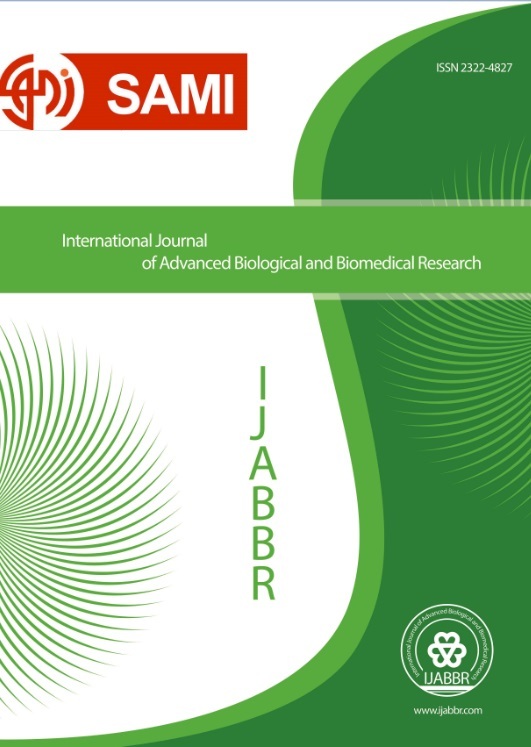 International Journal of Advanced Biological and Biomedical Research, 2, 5, 2014, 1761-1767. Nazari Zenouz, F., Moghaddam, G., Abdi, Z. (2014). 'Weight Changes and Sexual Behavior in Ghezel Intact and Castrated Male Lambs', International Journal of Advanced Biological and Biomedical Research, 2(5), pp. 1761-1767. Nazari Zenouz, F., Moghaddam, G., Abdi, Z. Weight Changes and Sexual Behavior in Ghezel Intact and Castrated Male Lambs. International Journal of Advanced Biological and Biomedical Research, 2014; 2(5): 1761-1767. Castration of male animal's leads to a reduction in aggressive behavior, which animals will avoid wasting energy resulting to economic production of the animal, grows. It also reduces damage and bruising animals and increases normed meat producing at slaughter. In this study, 20 lambs Ghezel breed in four age groups, group 1: one month (n = 4), group 2: two months (n = 4) Group 3: three months (n = 4), Group 4: four months (n = 4), were selected and by the surgical procedure were castrated. For comparing the effects of castration on fattening capacity and frequency of sexual behaviors, group 5: one month (n=4) was used as a control group. The GLM procedure of SAS in unbalanced design was used. Five groups of lambs were fed with a same diet of fattening for 270 day. Lambs weighing was done after 12 hours of starvation every month. A significant difference was observed between control group and other castrated groups (P<0.0001). The control group lambs showed a higher final average weight (46.125 kg) than the other castrated groups, group one: (41.6071 kg), group tow: (41.205 kg), group three (40.2823 kg) and group four (40.962 kg). Daily average gain for all groups was similar (Group 1 (133.024 g), Group 2 (120.307 g), Group 3 (113.48 g), Group 4 (113.154 g) and control group (152.068 g)) which was not a significant difference between castrated groups with control. Body condition score at the end of period were measured for all groups and no significant difference was observed. Each of sexual behavior decreased significantly between the castrated and control group. The results showed that castration depressed aggression and reproductive behavior of animals. Weight of castrated group was lower than the control, in which the lamb that had been castrated at younger ages due to the low stress and get away from castration were better at slaughter time.